Welcome to my blog, I look forward to sharing my love for local food and the people behind it. The farmers, butchers, bakers, foragers, chefs & artisans that dedicate their lives to feeding our world. Stories about the passionate people behind BC’s local food & drink scene. Follow Jennifer's latest, greatest food adventures as she hops around the province meeting amazing food and drink folks and tasting the best farm to table/sea to table on offer around the incredible, edible British Columbia and beyond. This article has been published in newspapers across Canada and shared in various social media venues internationally. Livingstone, Zambia was the primordial reality of all of my childhood dreams. Spirit, movement, instinct, survival all awaken within. It peels back reality and earnestly offers a nakedness and raw sense of life that takes time for the mind to acclimatize. The absolute wildness, the awareness of the proximity to the magnificent animals living here, and the realization of being so near the cradle of civilization whispers deeply to the ancient part of our spirit. Nothing was contrived or commercialized in the way I had childishly envisioned. You are exposed to borderless animal parks where random zebras show up on the side of the road or a herd of one hundred elephants may hold up traffic. As the locals say, elephants have no borders. I stumbled upon an advertisement for a new restaurant that has been receiving rave reviews. An event in itself, the squealing ride up the vital Zambezi expertly navigated by our captain, had us zigzagging around hippos and crocodiles, and over white water rapids, spraying us with water under the warm African sun. The open-air restaurant is a sight to behold. Architecturally designed partially on stilts in the river, it is a Bedouin-style tent, with lush furnishings inside. We were welcomed on shore by charming chef Annabel and the elephant handlers. 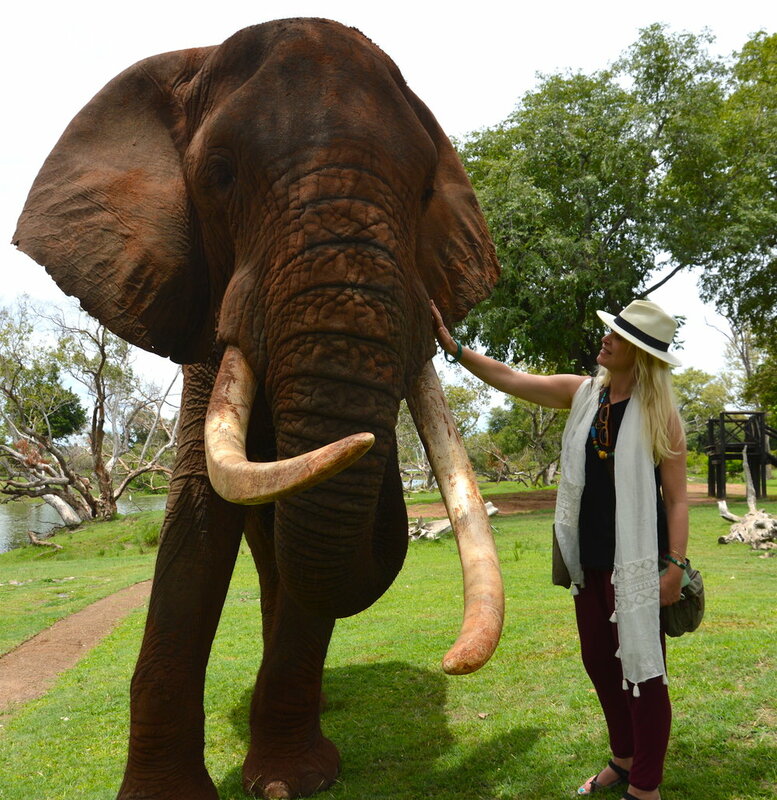 First, we were to meet three of the sanctuary’s elephants and have the opportunity to feed them. Then we were to proceed to the restaurant for a Champagne cocktail and chat about their elephant conservation project during a three-course meal prepared using locally grown and foraged ingredients. It is hard to describe the feeling of being so near these majestic creatures, close enough to look into their eyes and feel their energy. The elephant community of ten here, came from a variety of situations. Some were adopted as babies when found abandoned, usually due to drought conditions, or rescued from abusive situations, or as victims of an elephant cull (another horror story). Together they have formed a new family. Here in the most natural of settings, this sanctuary represents the desperate movement to preserve and increase the population of these noble creatures. Annabel’s has coined her gastronomy as “Bush Gourmet”. The dishes offer unique, explosive flavour combinations fusing the familiar with the unfamiliar. It was, in many ways, the most exciting meal of my life. It's Annabel’s vision and the epitome of wild creativity. "For nearly five years now, since moving to Livingstone in Zambia, I have been experimenting with, and fusing, wild edibles and indigenous Zambian ingredients with fresh local produce, mostly grown in my own organic garden," explains Annabel. "I develop African Fusion recipes, inspired largely by Mediterranean, Southeast Asian, North African and Middle Eastern cuisines, which I refer to as “Bush Gourmet”. I rely on the centuries-old wisdom of my neighboring riverside communities to help in foraging for wild food, while the Zambian chefs with whom I work and train, have led me to the indigenous ingredients in Livingstone’s native markets. It is my sincere hope that by promoting the use of these diverse, and largely unexplored, natural resources, Livingstone’s local economy is also enriched." Annabel is more than a chef and adventuress. As she describes, she and her husband Chris Aston live open-air in a “corrugated tin box built on a concrete slab thrown under an old Mongongo tree on the Zambezi River." She is a gardener, forager and a wonderful writer offering insights into her life through her blog called SavannaBel.com. Born and educated in Zimbabwe, Annabel ventured to the UK and North America working as a journalist-activist for 14 years. A passion for her culture and cooking brought her back to Africa where is able to combine all her skills in the kitchen together with her knowledge of farming, to develop new flavours to share. Annabel works closely with her chef team and community and her palate is ever evolving, offering endless creativity to her dishes. Recent developments in Annabel’s career have lead her to expand and create a consulting business where is now able help other restaurants create menus based on her philosophy of local, foraged bush cuisine. She is essentially redefining the cuisine of Zambia and in doing so increasing the chances of local farmers and artisans to thrive. Stay tuned for news of a book one day. Africa is gracious and I made many friends in the short time I was there. Whomever I told that I loved their country and would return, the response was always: “I will wait for you”. And I will dream of you.